This stylish, RFID secure ziparound will protect you from electronic pickpocketing, and has seven card slots plus two clear ID windows with thumbhole and an interior, zippered change compartment. Three additional, large pockets will store cash, receipts, or additional cards. This wallet will even hold and protect a full size passport. A large, gusseted interior pocket fits many smart phones. You get two shielded wallets for the price of one. 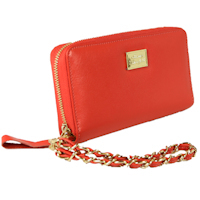 Tucked inside is a removable card wallet with 3 card slots plus two larger compartments which will even hold your cash. Great for slipping in your pocket on the run. This RFID blocking leather purse has a Secure by Design Police Approval Specification for Identity Fraud Protection.